These Damn Cosplaying Kids Need To Get Off My Lawn! Can you figure out which is which? If not, then you might be among those that American Enterprise Institute Fellow James Pethokoukis identifies as a critical sign of trouble with the American economy. In an editorial for The Week adorably titled "Why the rise of cosplay is a bad sign for the U.S. economy," Pethokoukis launches into one of the most spectacular old man diatribes since Abe Simpson first declared that there are too many states. That's a problem Japanese twenty-somethings have faced for more than 20 years. Two decades of stagnation after the collapse of the 1980s real-estate and stock bubbles - combined with labor laws making it tough to fire older workers - have relegated vast numbers of Japanese young adults to low-paying, temporary contract jobs. Many find themselves living with their parents well into their twenties and beyond, unmarried and childless. 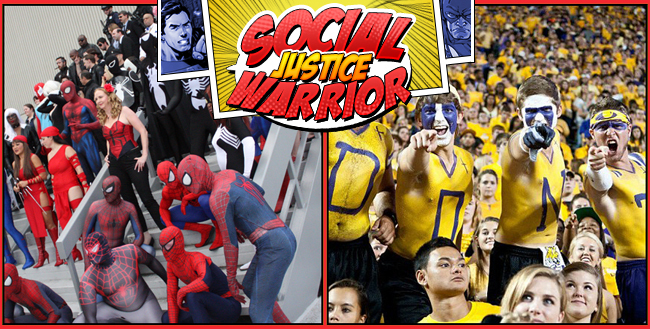 And guess what: America has a growing number of make-believe "cosplay" heroes, too. Pethokoukis, to his credit, is largely sympathetic to the reality that the economy is fairly terrible, particularly for young workers saddled by a lack of jobs and tremendous debts incurred from higher education. He also notes, accurately, that policies pursued in Washington have done little to mitigate these problems. Good job, because the fact is that new entrants into the labor pool are fucked in a way those who entered the workforce during the long economic good times enjoyed by the Baby Boomers, or who got in before the great recession, have tremendous difficulty understanding. But it's absurd to see the rise of a popular new pastime as somehow symptomatic of those larger economic problems. First and foremost because cosplayers aren't some monolithic group of people with a single attribute. The community has as many working professionals as it does students and those struggling through this economy. And for what it's worth, they actually do contribute fairly significantly to the economy. Atlanta, Georgia's Dragon Con, which as we've already discussed is essentially the yearly event for Cosplayers, generated "$55 million in direct economic impact " for the city in 2014. Similarly, San Diego Comic-Con injects approximately $165 million into the local economy every year. And it's all thanks to the tens of thousands who attend, at their own expense, spending money on everything from hotels to food to simply taking in local attractions. This community generates so much money that the city of Baltimore is worried about the impact of losing Otakon. Cosplay isn't cheap. Even the thriftiest cosplayer may spend hundreds of dollars on their costumes, money they have to earn by, yes, working at a job. 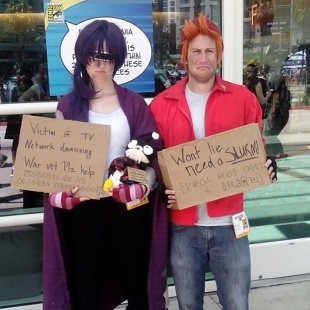 And a shocking number of cosplayers actually earn a living from it. Certainly, like everyone else in this wretched economic hellscape, many cosplayers experience financial insecurity, but it isn't like there's some kind of public benefits program for people who really know their way around realistic armor. * Something to consider is that the American conception of Japan's economy as a tortured, malaise-ridden mess, is not factually accurate. Japan's unemployment rate is 3.5%, compared to the United States' 5.9%. Other economic measures are roughly what you'd expect factoring in population and resource accessibility.